There are several options when it comes to hot water heaters, and the choice of fuel is just one of them. While electric water heaters are a popular option for folks in the Cincinnati area, gas is a very popular fuel choice as well. Natural gas powers a lot of home appliances from stoves and ovens to clothes dryers, so it is no surprise that people would turn to gas for heating their home’s water supply as well. Generally speaking, gas is less expensive than electricity, which probably helps to explain why so many prefer gas. It should also be noted that gas heats water much faster than electric will, and it has a faster recovery time. 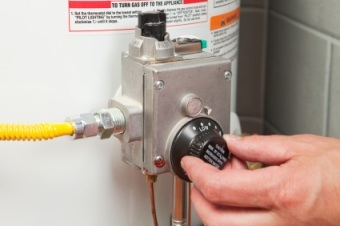 When determining if a gas water heater is right for you, the first thing you need to look at is whether or not gas is available to you. For a lot of people if gas appliances are already in the home then this is relatively an affordable fuel choice to switch over to. In some areas, gas may not be an option if you don’t have gas lines running near your home, and even if you have them nearby, running the line to your property may be out of your budget. Speaking with our professional plumbers can help you determine the right style of heater for your home, including the proper fuel source, but fuel type is definitely not the only consideration to take into account when selecting a water heater. There are tankless heaters, storage tank heaters, and other categories of water heaters fueled by natural gas, propane, and electric. The type of hot water system you need and the size of your structure (and the space for the heater) play a part in the selection process. If you make the wrong choice, you may find that you don’t have enough hot water for your household, and you may even find yourself having to replace your new water heater far too soon. Working with a professional that has years and years of experience to select your water heater is a smart idea; it can save you some hassles, headaches, and money.